A student at The Sixth Form College, Solihull organised an awareness campaign for autism last week. Jessica Smith organised an awareness and fundraising event for Autism by supporting a national campaign called Silly Sock Day. 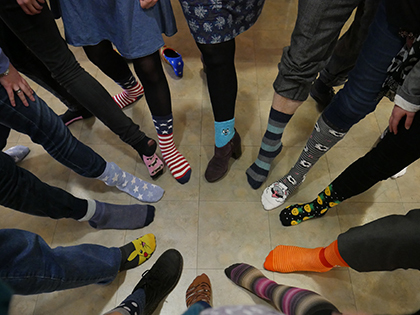 Staff and students came into College wearing their most outrageous socks to support the campaign. Jessica had put together an information stand in the Refectory with educational information on ASD, Aspergers and ADHD, including details of famous people who manage the conditions themselves. Staff, including outgoing Principal Paul Ashdown and incoming Principal Martin Sullivan, were among the staff to support the event. The event had the support of the Student Development Officers at College, who work to support a host of extra-curricular activities at College, ranging from student societies to faith meetings to charity events. They also support the Student Council and Student Health Ambassadors. The latter produce regular health and wellbeing campaigns to raise awareness about healthy living.